Beth Menachem Chabad is founded on the principle that, while Jews embrace many levels of observance in their personal lives, there should be a place for all Jews no labels, no affiliations. They develop a sense of community and enhance the experience of being Jewish. They have successfully catered to hundreds of families from all backgrounds, offering Jewish educational programming in an accepting and innovative setting where all feel welcome. The goal is to create a positive Jewish experience for everyone as they strengthen their ties to the Jewish community. 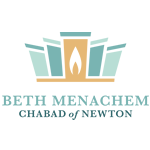 Beth Menachem Chabad is a place where every Jewish person is welcome - regardless of affiliation or level of knowledge. Our sole purpose is to create a warm welcoming environment to explore and experience our heritage in a non-judgmental and inviting atmosphere. Beth Menachem Chabad of Newton is a Synagogue and Community center reaching out to the entire Jewish Community. Since it's inception in Spring 2000, it has touched and influenced thousands of lives. Whether they are families from Israel who are unaffiliated with a Synagogue, immigrants from Russia who never learned to read Hebrew prayers, or Americans who are seeking spiritual meaning, all of them have found a welcome home and community here. Due to our rapid growth, in 2012 we moved into our newly built center located on the corner of Dedham Street and Rachel Road. Aside from regular services, Beth Menachem holds family holiday celebrations and events where families can celebrate together in a comfortable social environment. Families that may not have a strong enough commitment to have membership somewhere, choose Chabad to celebrate their Bar Mitzvah. We have a monthly teen program for Public High School Students where they volunteer to give to the community. Rabbi Chaim Prus has been the Chabad Representative to Eastern Massachusetts since 1975. He is the director of Chabad House of Greater Boston at 491 Commonwealth Avenue, Boston. He founded the Chabad Center of Lexington in 1985. Rabbi Prus is the spiritual leader of Beth Menachem Chabad since 2000. He received ordination from Central Lubavitch Yeshiva Tomchei Tmimim, New York. Nechama Prus has been a Chabad Shlucha since 1975. She has taught high school and adult education, and has organized women’s events. She currently plans special programs for Beth Menachem Chabad and teaches Torah and Hebrew reading. Nechama Prus earned a teachers degree from Jerusalem College for Women, and a BSBA from Northeastern University. Rabbi Shalom Ber and Itty Prus joined Beth Menachem Chabad in 2013.